Little did he know when he threw himself upon the mercy of The Pride and her crew that he put the entire hani species in jeopardy and imperiled the peace of the Compact itself. For the information this fugitive held could be the ruin or glory of any of the species at Meetpoint Station. ©1982 C.J. Cherryh (P)2012 Audible, Inc.
A great offering from a much under rated author and one who shows a vast imagination for other worlds. I've read this series several times before, but it was great to sit back and listen to it. Character voices are distinct and the alien terms are pronounced smoothly. The only downside is that the narrator skips over the '####' that denotes a static sound effect, which impacts the meaning of some dialogue. This is a remarkable book, with vivid, complex characters, well-built worlds, and alien species that are clear and memorable. These species are thoroughly alien, and yet, when we consider them through Pyanfar Chanur's eyes, they make their own kind of sense. Pyanfar Chanur is a shrewed space merchant captain. She's swashbuckling enough to thrive in the sometimes-deadly bluff and counter-bluff of trade and politics between six very distinct spacefaring species. Still, despite swagger and sharp dealings she's an honest, decent captain with a fine, honest crew of kinswomen. In fact it's that very decency, shown in the companionable laughter of crewwomen unloading cargo at dockside on a space station deep in alien territory, that makes a desperate human fugitive choose Pyanfar's ship to try to stow away on. It's also that same decency that makes Pyanfar refuse to return the human (a member of a never-before-seen seventh intelligent species) to the predatory Kif who had attacked his ship and tortured his crewmates to death. There are some things a decent Hani captain just can't do. Only, by the end of the book, and again by the end of the series, Pyanfar changes her mind about what some of those things are. While the human, Tully, proves his worth and earns a place in Pyanfar's small crew, the crisis with other species escalates. The deadly Kif want Tully badly enough to go to war to get him. The devious, physically-fragile, timid but ruthless Stsho want their own safety and profit at any cost to other species, and they will placate the Kif if that seems safest. The primate-like Mahendo'sat certainly want something very badly, but it's hard even for a shrewd Hani captain to detect what exactly they're after. A Mahendo'sat captain called Goldtooth seems to be turning into an ally against the Kif (and Pyanfar and her crew desperately need allies), but Goldtooth represents a Mahendo'sat Personage with unknown motives. Can even captains of sincere good will twist their orders far enough to stand by their friends when the best interests of their species come into conflict? And then there are the methane-breathers, who make no sense to anybody who breathes oxygen, and who are wild cards that can change the whole situation. Every time I read or listen to this book (and I've listened to it several times already, after having read it many times in hard copy), I'm struck by the book's sheer craftsmanship. It's exciting, and dramatic, but it doesn't slip across the line into melodrama. It's fascinating, and it deals with profound, complex issues, but it isn't pompous, pedantic, or analytical. It's tense and suspenseful, but it's also amusing, often in a wryly self-recognizing "Oh, isn't THAT the truth" kind of way. The story is character driven, but with a rip-snorting plot that could easily steal the show if the characters were weaker and less engaging. By the way, this book is a stand-alone story, complete in itself. It's not a cliff-hanger. The next three books (Chanur's Venture, The Kif Strike Back, and Chanur's Homecoming) together tell a second story about Pyanfar and her crew.The fifth book in the series, Chanur's Legacy, tells a third story all in one volume. The five books together are a tour de force, but this first book, Pride of Chanur (punning on "pride," the emotion, and pride as in a pride of lions--the Hani are very lion-like) is one of the all-time great enjoyable works of science fiction. This series is in many ways Cherryh's most accessible one. She takes on one species after another and makes them real as a dime. And comprehensible by their own lights. Without ever making them into humans with fur or feathers. It's a wonderful space opera, which I normally hate. But here, when the alliens are so alien and yet, somehow people you know, how can you resist? Some whiny bits in the dialog. Listen to it and see what you think. It didn't ruin my enjoyment of the books.But you might feel differently. If you could sum up The Pride of Chanur in three words, what would they be? No I haven't, but she was a great reader. Just very happy to have this entire series on as Audio. Dina Pearlman is a great reader. Please Audible Frontiers have her read the C. J. Cherryh Merchanter Books 'Merchanter's Luck', 'Tripoint', 'Rimrunners' and 'Finity'd End' . More wonderful books that deserve to be in audio. A good story--one I've read several times in the paperback. Nice, exciting space opera--various species, shoot 'em ups--lots of fun, setting up future tales with these characters. While this volume ends with a complete tale, I'm aware that the next couple of books in the series end with cliff-hangers. But there are problems with narration in this one--insufficient distinction between character voices, and frequent misread words: operation for option, relegated for related, etc. (And in cases where the wrong word is so completely out of place, it should have been noticed: "Whether they were relegated or not she could not determine.") Also, misplaced pauses in narration, such as "He walked the corridor narrowly (pause) avoiding..." rather than "He walked the corridor (pause) narrowly avoiding..." I won't actually avoid books with this narrator, but I certainly won't seek them out. Unfortunately for me, this narrator reads the rest of the series; if I want the series, I'll have to put up with the reading. Here's hoping it improves. I'm delighted to be able to get Cherryh's books in audio format, so I'm willing to put up with this narration. But better narration would have made a more enjoyable listen. CJ Cherryh is one of the best SF authors, ever. I have read all of her books. I am starting with an older book (hopefully remembering less) and have had the pleasure of experiencing her genius all over again. She is able to look at us from the outside, from a different perspective. Her writing skills are superb and her ability to paint pictures with words is extraordinary. I was waiting for her books to "become" audible and now they have arrived. I would suggest you listen to them in order. For those of you who are long time fans of CJ Cherryh, I need say nothing. For those of you for which she is a new author, you are in for a special treat. The narrator did a very good job. You get caught up in the story and forget you are in your own house! Like seeing old friends after years absent. What other book might you compare The Pride of Chanur to and why? Minor Spoliers! Cherryh's Foreigner series has a lot similarities to Chanur - Lone human surrounded by strange aliens he only somewhat understands, although in Chanur you never are from the PoV of Tully and are very much so in Bren in the Foreigner series. Also the Lone human and Alien female romance, although it's not much delved into or explored in Chanur between HIlfy and Tully. Well...she was good...various voices and accents for the characters. Overall she was very good except in ONE glaring aspect that annoyed me every time she did it. The character voices are always delivered in the same way. For example, there's one crew member,Chur, who is badly hurt and during her recovery she's often noted as speaking in a whisper or other pained voice...but Pearlman reads it like they were just standing there with nothing wrong. Other than that she did an excellent job, I especially liked her portrayal of Jik and Goldtooth. Hard not to rave about this series. I've read the hardbacks at least 5 times over the years and I am thrilled Audible is going through the backlog of older series like this and putting them up. Like I said in the review title, it's like seeing old friends after being long absent..the kind of story that makes your heart ache when it's all over because you want so badly for the story to continue. Science fiction classics in new light of Dina Pearlman. It was so great to listen to an audio of this series after all these years. I've loved a lot of C.J. Cherryh's books but this is my favorite series. Did not make it past the first or second of the Foreigner books, and essentially stopped reading scifi at that point anyway. I love the less powerful characters in her books and how they solve their survival problems. I hope they also make audiobooks of Hunter of Worlds, Rimrunners, Merchanter's Luck, Wave Without a Shore. All great scifi. Didn't it make you laugh though about how primitive the computer capabilities were? Who could have imagined...? I thought the reader did ok. She sounded a bit like Sigourny Weaver to me. And my doctor. 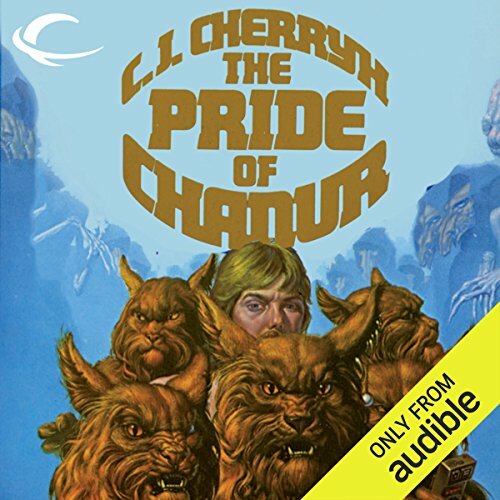 Where does The Pride of Chanur rank among all the audiobooks you’ve listened to so far? I have many favorites among the numerous genres that I read (listen to) This book is one of the best of its genre. C. J. Cherryh is one of my favorite sf writers. There are enough clues as to how other races may have developed, their society and rules to keep the reader thinking and imagining how a human would react if he/she was in Tully's position. The narrator has a talent for projecting the voices of the different characters without being laughable in her efforts. I'll definitely listen to the other books in this series. The Captain of the Pride was of course my favorite character. She dominated the story and her viewpoint drives the tale. So many to choose from that I can't select my one favorite scene. The on planet activity toward the end was attention getting as much as the station scenes and the shipboard activities. I loved these books when they first came out and Dina Pearlman's narration adds a new and excellent dimension. C J Cherryh is one of my favourite authors. Her unique writing style, which Cherryh has reportedly called "intense third person" (although the source of this is WIkipedia) lends itself to a fast paced narration. The characters are believable and all too Hani. A great book spoilt by the narration. How many variations on the name Pyanfar, or pronunciation of Chanur do we have to take ? The narration lacked pace and vocal definition and variation of characters. Such a shame. The narrator has strange pronunciation of some words (e.g. "Buoy"), but a voice that's easy to listen to. C J Cherryh creates great aliens and this book is no exception. The story is told from the point of view of the Hani, a species where the females are the space-farers, forging a trading compact with 5 other alien species, whilst the males remain on the home world. The crew of the Pride of Chanur make first contact with a new species when one of them seeks refuge aboard their ship. We see the struggle of the characters to understand each other and to interact with other species,especially when the language and actions of some species are so different as to be incomprehensible and the arrival of the stowaway will have an impact on relationships within the compact. I found the action scenes hard to follow, I'm not sure if that was because I lost concentration or because they were just confusing. All in all, however, it was a good read and I will definitely be reading more of her books.